Today, 23rd November 2018, is being celebrated as the GurParab and marks the 549th birth anniversary of Guru Nanak Dev Ji Maharaj, the first Guru and the founder of the Sikh religion. 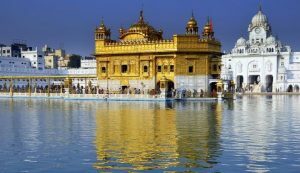 It is considered as the most sacred day in Sikhism. The date of the occasion varies from year to year, based upon the Indian lunar calendar. GurParab or Guru’s day is celebrated on his birthday and has a special significance among the followers. On this auspicious occasion of Guru Parab, Sikhs do special service in Gurudwaras, put up stalls and feed millions in the langars (community kitchens). On this occasion, it is a holy experience to take part in all Gurdwara functions and make a pledge to follow Guru Nanak Dev Ji’s teaching of equality, love, and goodness in humanity. The devotees start the Guru Akhand Path two days before the birth anniversary which consists of 48 hours nonstop reading of the Holy Guru Granth Sahib. The poetic hymns of Guru Granth Sahib Ji – the holy text in Sikhism emphasizes the need to overcome vices like lust, greed, anger, attachment, and Pride and devote our lives to selfless service of the creator. GurParab helps in bringing our focus back on seeing humanity as a whole, with no divisions in cast, creed or color. A true lover is not concerned with the intricacies of wisdom, of meditation, and subtleties of karma philosophy. He is not concerned with Gian Yoga, Dhian Yoga and Karma Yoga. Intense faith in the Supremacy of his beloved, Sri Guru Nanak Sahib constitutes his true devotion. Love of Sri Guru Nanak Sahib is his Supreme devotion and concern. I bow in reverence to Guru Nanak Dev Ji on this auspicious occasion of GurParab.